McIlroy raced into contention with two birdies and an eagle in the first nine holes of his third round. Rory McIlroy: on the march. WORLD NUMBER ONE Rory McIlroy made a late charge up the leaderboard but still trailed Denmark’s Thomas Bjorn by five shots after a marathon day three at the Barclays Singapore Open today. McIlroy raced into contention with two birdies and an eagle — offset by a watery double-bogey — in the first nine holes of his third round before nightfall halted play in the storm-hit tournament. The third round only started at 8am Irish time after weather interruptions over the first two days meant most of Saturday was taken up with completing the second round at par-71 Sentosa Golf Club. Bjorn, 41, was top of the leaderboard at nine under par for the tournament after a 67 in his second round, which gave him a great chance of his first win of the year. England’s Chris Wood was a shot back at eight under par, with South African George Coetzee two adrift at seven-under after a brilliant 63 in round two. Ryder Cup star Francesco Molinari was six-under for the tournament alongside Thailand’s Chapchai Nirat, while three-time winner Adam Scott was at five-under. McIlroy was tied for 13th at four-under in a group including Louis Oosthuizen. Two days of storm delays dragged the second round out over 28 hours, and it was a long shift on Sunday with the players on course at 7:30 am and not finishing until nightfall nearly 12 hours later. McIlroy, needing a top-three finish to be confirmed as the European Tour’s top prize money-winner this season, admitted the weather delays were frustrating after recording successive 70s in his first two rounds. But the Northern Irishman, with tennis star girlfriend Caroline Wozniacki among the large gallery, looked fired up as he began his third round and he rolled in a 15-foot birdie putt on the second hole. McIlroy missed a 10-foot birdie putt on the third — after a breathtaking approach from sloping rough — but a huge drive over water, a blistering second shot and a seven-foot putt yielded an eagle on the par-five fourth. However, McIlroy angrily thumped his driver into the ground after putting his tee-shot into water on the harbour-flanked sixth hole, and after a drop he chipped and two-putted for double-bogey. His challenge seemed shot, but McIlroy hit back with another birdie on seven and missed a final birdie by a hair’s breadth on the ninth hole in the quickly gathering dusk, after the hooter had signalled the end of play. “I played well when we got back out there, got off to a good start then unfortunately made a mistake on the sixth but got one straight back on the seventh,” McIlroy said. Play will resume at 7:30 am with another long day in prospect as organisers try to cram the best part of two rounds into Sunday. With more weather delays, they will either cut the event to 54 holes or extend it into Monday. Email “Rory McIlroy makes charge in Singapore”. 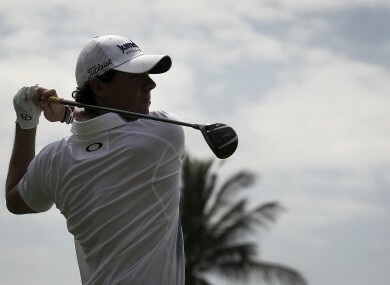 Feedback on “Rory McIlroy makes charge in Singapore”.